These softly padded, double-sided flexible files let you sand convex or concave curves, small slots and other hard-to-sand shapes without gouging or scratching. Each end of the file has a 15 degree taper for deburring, sanding and polishing hard-to-reach areas. Use them on wood, metal, plastic, fiberglass and most other materials. Clean with soap and water for extended life. 1/8 inch thick x 1/2 inch wide x 5-3/4 inches long. Use dry or wet for ultra-smooth finishes. 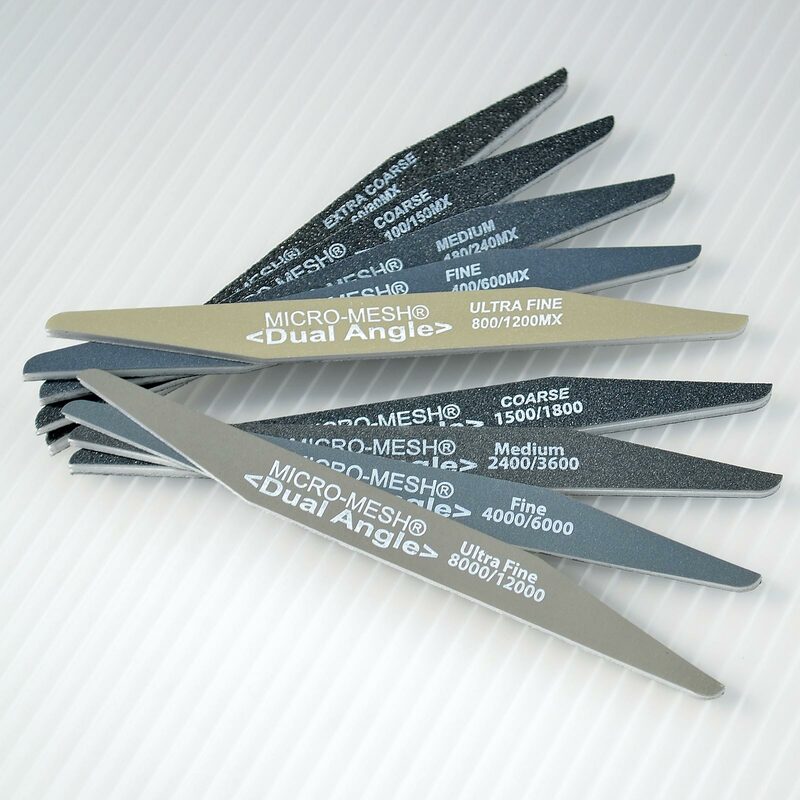 #86128 9-piece Dual Angle Sanding File Set includes 5 standard files for normal use, plus a set of 4 extra-fine files for removing imperfections and restoring canopies, windshields, headlights and other clear plastic items. Works equally well on other plastic, metal and painted surfaces. Total assortment of files (one grit per side) includes 60, 80, 100, 150, 180, 240, 400, 600, 800, 1200, 1500, 1800, 2400, 3600, 4000, 6000, 8000, and 12000 grits. Great little sanding files, be advised this is a combination of two different product lines from Micro-Mesh, their standard line, and the MX line. The differences include the hardness/stiffness of the adhesive holding onto the grit. The MX is stiffer and more appropriate for metals, the other set is more flexible and for everything else. Also be aware that the grit numbers on the files can differ substantially from ANSI grit sizes and it is necessary to reference a conversion sheet that can be obtained from Micro-Mark. For example ANSI grit 1500 is the same as sanding stick 600MX and also sanding stick 4000.